Home Plumber, Plumbing Services, Drain Cleaning and More! Raab Plumbing & Heating is a family owned, locally based plumbing and HVAC company based in Dryden, MI. We are a small plumbing company and being such, we can give you more personalized service. Your satisfaction is our number one priority. We are a full service plumbing company and promise the highest quality of plumbing services, top notch brands, competitive rates and friendly advice. We service all of the Dryden Mi area and all surrounding areas. Barry Raab of Raab Plumbing & Heating is a master plumber with years of experience in the plumbing and HVAC fields. No job is too big or too small. Whether you need a new faucet installed, drain cleaning, leaking copper pipes fixed, water heater repair, bathroom fixtures replaced or any number of other plumbing services, Raab Plumbing & Heating is the professional service to call. 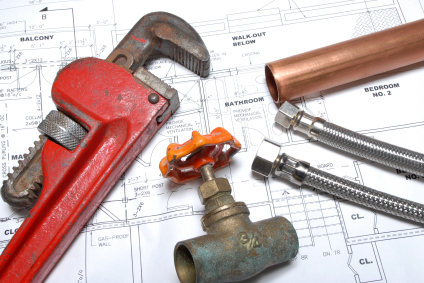 We offer residential plumbing services along with commercial plumbing services. Our extensive experience in the commercial plumbing arena allows us to complete a commercial plumbing job efficiently and on time. We know that your time is valuable and we respect that. We will make every effort to be at your plumbing job on time and finish in a timely manner. This will also save you money. Raab Plumbing & Heating carries only the best and most respected brands in the plumbing industry. Brands such as Amercian Standard, State water heaters, Toto toilets, Delta faucets, Kohler, Moen, AO Smith, Gerber and many more. We can install bath tubs, tankless water heaters, water softeners, drains, sinks, plumbing fixtures, shower heads and more. We can also help with your kitchen remodeling jobs and bathroom remodeling jobs. Raab Plumbing and Heating also specializes in water heater repair! Water heaters have a finite lifespan and you can keep yours running longer and more efficiently with regular maintenance and cleaning. Raab Plumbing & Heating can help you maintain your hot water heater and keep it in tip top shape. As hot water heaters age, systems can break down. When your hot water heater breaks give Raab Plumbing and Heating a call and we can fix your problem fast, efficiently and for a competitive cost. Not only do we help maintain and repair hot water heaters but we also sell and install brand new, top quality hot water heaters. Raab Plumbing & Heating also specializes in HVAC services. Services such as furnace repair, furnace replacement, furnace inspection, furnace cleaning, air conditioner sales, ac repair, duct work and more. Barry Raab, the owner of Raab Plumbing & Heating, is courteous and knowledgeable and has over 36 years experience in the plumbing field. He will be there personally to assist you from your first inquiry up until you are completely satisfied. Being a master plumber, he stands behind all of his work and is confident that you will have a positive experience with Raab Plumbing & Heating. We look forward to becoming your preferred plumber.